Come a see London's oldest complete building, nearly 1,000 years old and home to one of the largest diamonds in the World! A fortress and a Royal Palace, a prison, an execution site and now home to the fabulous Crown Jewels. See the World in a morning on my "Highlights Tour! With 2.5 miles of galleries and free admission, get ahead of the crowds and see the Rosetta stone, the Parthenon Marbles and the Egyptian Mummies with me, your Blue Badge Guide. Less than half an hour from central London, Hampton Court is two royal palaces in one, combining Henry VIII's Tudor home and Sir Christopher Wren's Baroque extravaganza . The estate offers a 300 year old maze in the world, the oldest vine in the World and gorgeous 16th and 17th century gardens, plus a restaurant on the site of a 16th century jousting yard! Just a quick train journey from central London, Windsor Castle is the favourite home of Her Majesty the Queen, the oldest continually inhabited Royal Palace in the World and contains fabulous works of art. Blue Badge Tourist Guides are the only guides allowed in Windsor Castle! I've passed the Institute's exam enabling me to guide the former Olympic Site! See the Stadium and the Aquatics centre. Hear all about the "Olympic Legacy"and be brought up to date on on all the exciting Sustainable Development plans for the Park. Come on my 2 hour walking tour of Westminster, the centre of Royalty and Government for 1,000 years! You'll see the Abbey, the Houses of Parliament, Whitehall, the London Eye, Trafalgar Square, St. James Park, Buckingham Palace and the Changing of the Guard. You'll hear the Royal stories, enjoy the history and the children will not be bored! Be different to other tourists and visit a unique collection of one family's obsession with all thinks gorgeous and exotic! 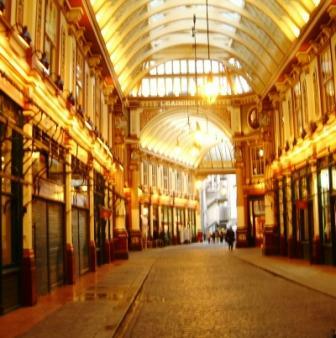 The Wallace is a "cultural oasis" amidst the shopping frenzy of Oxford Street - you will be transported to another world!. Admission is free and there's also a rather lovely restaurant in the courtyard! One of the World's best art collections, the National Gallery has paintings from the 13th century to 1900. With my 2 four Highlights Tour, you'll see the famous works by Botticelli, Leonardo da Vinci, Holbein, Turner, Constable, Monet and Van Gogh and admission is free! And why not visit Tate Britain and Tate Modern with me – where you'll find British and World Contemporary Art at its best! The largest collection of decorative arts in the World, with works from all periods and all continents . My Highlights Tour includes the best collection of Italian sculpture outside Italy, the amazing British Galleries (16th to 19th century) and not forgetting the Fashion section, with 17th Court dresses, 1920's Chanel evening wear and the inimitable Vivienne Westwood! There's more to London's Soho than its sleazy reputation. Come and find out more about this fascinating quarter of London: a home to artists and bohemians, a haven for immigrants, a criminal underworld, host to the alternative club scene for generations and still the centre of the film and fashion industry! Two hour and a half hours stroll, starting in Soho Square. Forget Jack the Ripper! London's Theatre land has more reported sightings of ghostly apparitions, thespian hauntings and sheer bloody murder than anything the East End has to offer. Come and walk in the "limelight" with me from Drury Lane to St. Martins and discover the nastiness that lies behind the neon lights. You′ve gone on the Studio Tour, you′ve read the books and seen all the films, but did you know that many of the scenes from the films were shot in London and that London locations inspired JK Rowling herself?